Sonya Bateman lives in upstate New York, where there are two seasons: winter, and construction. Her home is shared with a husband, a son, three very strange cats, and a gerbil with half a tail. She enjoys reading and swimming, and wishes there were some feasible way to combine the two. In addition to spending a lot of time writing, she is attempting to learn how to speak Japanese. Read an excerpt at Sonya Bateman’s website. CLICK HERE FOR MORE BY SONYA BATEMAN. 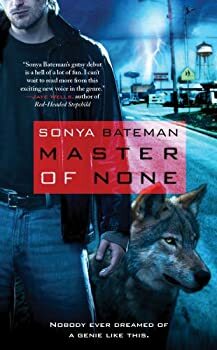 If you took parts of the Arabian Nights and remade them in an urban fantasy mold, one of the stories would come out something very similar to Sonya Bateman’s Master of None. Gavyn Donatti, a professional thief, is hired to steal a small item for a local crime boss, but somehow Gavyn manages to lose the item before handing it over to his employer, and this bit of bad luck ends up sending Gavyn on the run. He is saved along the way by a Djinn named "Ian." When circumstances outside of their control lead them into a contentious partnership, they must learn to work together in order to save their loved ones and maybe the world.